Total trade in goods exports for September 2018 were £32.3 billion. Total trade in goods imports for September 2018 were £41.6 billion. 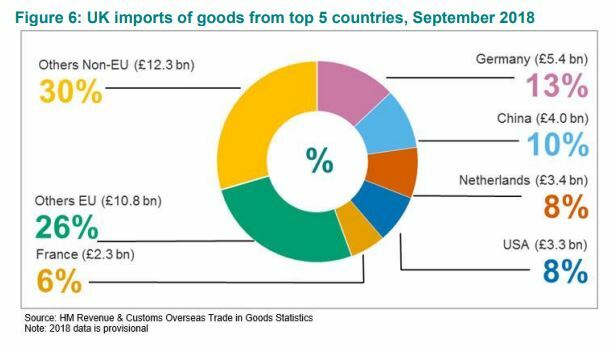 The UK was a net importer this month, with imports exceeding exports by £9.3 billion. For EU trade the UK was a net importer this month, with imports exceeding exports by £7.7 billion. For Non-EU trade the UK was a net importer this month, with imports exceeding exports by £1.6 billion. Germany accounted for 13% of the total value of imports to the UK. China had the second largest proportion of the total value of trade, accounting for 10%. 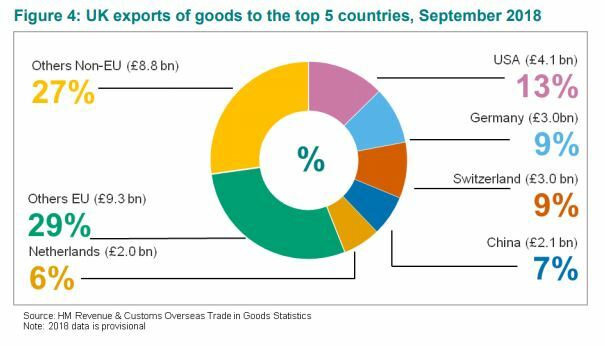 The top five partner countries accounted for 44% of total UK import value this month. total exports in goods this month. Spreadsheets are available which show the figures in more detail. The following tables contain EU and Non-EU import and export data for September 2018 at chapter level.